If you believe the speculation, Jawbone is having a tough time right now, and we haven't seen a new fitness tracker from the company since 2015. That being said, we're still fans of its family of Fitbit rivals, with notable mentions for the the UP2, the flagship Jawbone UP3 and the budget-friendly UP Move. A special mention should also go to the Jawbone UP24. It might be a few years old now but for the money, it's still a great option. There are actually two different UP apps in the App Store and Google Play, it's clear which one to download for your specific tracker, but they both offer a similar set of features and functions. The Jawbone UP platform is one of the best in the business, with plenty of features to motivate you to move more throughout the day (and tracking your sleep through the night). We've spent plenty of time living with the various UP activity bands, and we're perfectly placed to bring you a bunch of tips to make the most of Jawbone's colourful wearables. One of the main reasons we still go back to Jawbone's trackers is because of the way it handles your data, giving you tips based on the sleep and exercise you log each day. Jawbone has now added a new Insights section where you can get tips based on things like beating jet lag, receive vegan-friendly food recipes and even dating advice. To turn on the Insights, you'll need to select apps in the dropdown menu inside the Jawbone app to connect them to your profile. You can connect your band to the Nest thermostat to do something pretty cool. Once you've connected the two in the Apps section on the UP app, the temperature in your home can be adjusted on the thermostat based on whether you're just getting up or about to go to bed. The aim is to find your optimal sleeping temperature, something you can tweak by studying your sleep patterns the next morning. If you're already a bit of a fitness fanatic, chances are you've tried some other fitness platforms such as MyFitnessPal, Runtastic and Withings. The great thing about the Jawbone software is that you can link it to your existing accounts on many of these other platforms. Simply open up your UP app, tap on Apps in the menu, and then select the ones you want to connect to. RunKeeper, MapMyFitness, Fitmo, Strava, and Sleepio are just a few of the supported apps. You can get a full list of the compatible apps over in the Jawbone marketplace. 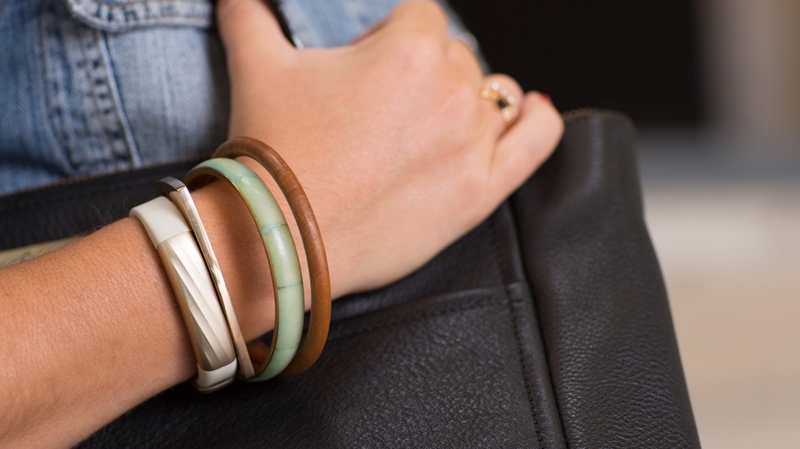 The Jawbone UP trackers are among the most stylish to wear although the Move still has that pedometer feel to it. Thankfully, if you do want to give it a more fashionable makeover, Jawbone now has a BaubleBar accessory range to cover up the plastic. The bracelets are available in three styles (Tango, Salsa and Disco), hiding away the tracker behind a more luxurious frame. We all know we have to drink a lot of water everyday, but it's easier for some than others. Jawbone plays nice with a host of apps and smart devices including the Pryme Vessyl intelligent cup. If you've got the $99 to buy one, it will integrate hydration data into the Jawbone companion app to add another layer of information on how healthy you've been during the day. Your Jawbone UP3 isn't the only device capable of syncing all sorts of powerful data to the UP app. If you have a Withings Smart Scale, you can connect the two services and automatically log your weight every time you step on the scale. Meanwhile the Orange Prep Pad smart food scale can be a great way to accurately log nutritional information through the UP app. Again, check out the UP marketplace for compatible devices. It stands to reason, those folks who walk their dogs every day get closer to their step goals than those who don't. The Whistle Dog tracker pairs with the Jawbone UP app, enabling you to see both sets of activity data in the same place. Pro Tip: Want to get more steps in? Get a restless dog. As you progress towards your step goals, the UP3 will vibrate at intervals of 2,000 steps, while you'll get a smartphone notification offering a summary of your steps at 4:30pm. You can customise these in the UP app, by opening the right menu and tapping Activity Alert. Perhaps you'd rather an alert at lunchtime so you know whether you need to do a power hour in the gym or whether it's Burger King for the 4th day straight. If you're using the Jawbone app on more than one device - but you sync with your phone most frequently - you can save yourself from having to sync the band with all your devices separately. Install the Jawbone app on your other devices as normal, log in, but don't select the "I have an UP band with me" option. This way, assuming your Jawbone is syncing with your primary phone, the information will be sent via the Cloud to all your other devices automatically. Useful for when you're sat on the couch with a tablet and you fancy having a quick look over your stats on a bigger screen. Another big post-release addition to the Jawbone UP3 is the ability to automatically know when you're falling asleep, this saves the hassle of switching modes by tapping the band, something which didn't work properly half the time anyway. Now the UP3 knows when you nod off and knows when you wake up without you doing anything. Jawbone works with other smart home services including SmartThings and IFTTT. There's a bunch of great Jawbone Up recipes already available as well to connect the fitness tracker to other smart home devices like the Philips Hue lightbulbs. Need some extra motivation to get more active? Studies show users with three or more connected friends move by 1,000 more steps a day. Jawbone has a couple of tricks up its sleeve to give you some incentive; whether you're the sort of person who thrives in a shared objective or wants to crush opponents competitively. The Team aspect allows you to group together with co-workers and pals to tackle collective goals, or take part in league-based trials. The new Duels feature lets UP users compete with each other in step challenges, as well as interacting with each other in the app - sledging is encouraged. You can log all of your meals and snacks into the UP app by typing them in manually or tapping some of the suggested options from the gallery. But there's an even simpler way, though it's not made entirely obvious. You can simply scan the barcode from the food or drink packaging. Once you're on the main menu for food and drink logging, you should notice a small barcode-like icon in the top left. Tap on it and it'll open your device's camera, which you can use to scan the barcode. It should detect and register it straight away, but don't forget that you can adjust the serving size once it's clocked what you've been putting in your cake hole. Although several new designs address the problem, the standard UP3 clasp is a bit awkward? We actually preferred the free-roaming design of the UP24. Anyway, because of the sensors located around the strap, a fastening is actually necessary. However, these won't be effective if it's not fitted correctly. We're not talking circulation cutting here, just enough for the sensors to be touching the skin at all times. The Jawbone connects to your smartphone via Bluetooth, but with the Jawbone syncing every 20 minutes, this can turn into a real battery drain. To save juice on your phone, make sure you close the app entirely and switch Bluetooth off on your phone. Everything will sync when you next open the app with Bluetooth on, but it means you'll be saving juice when your phone's in your pocket. The accompanying UP app is clever enough to provide you with a summary of your data at a time of day that you choose. This feature is a little tucked away, but if you head into Settings, then Notification Settings, you'll see some blue text at the bottom that says 'Take Action'. Tap on that and you'll land on the Activity Alert page. On here you can choose the time of day that you'd like to receive your summary. Opting for a time around mid/late afternoon makes most sense. You want to make sure you've got enough time to catch up if you find you're lagging behind on a particularly inactive day. Make sure that alerts are enabled before you exit the Activity Alert menu. Another feature that's slightly hidden away, the reminders function is a useful way of getting the Jawbone UP to nudge you when it's time to do a particular activity. For example, perhaps you need a dig in the ribs when it's time to hit the hay - you can set up a bedtime reminder that will repeat regularly (say every night at 10:30pm). You can even add in an amount of time to prepare for bed so your band buzzes, say, 30 minutes before sleep time. There are a few other preset reminders, such as workouts and meal times, but you can also add your own custom reminders too. We'd suggest one for charging the battery each week. The Apple Health app on an iPhone enables users to get a complete picture of their health from a number of connected sources. Given your Jawbone UP3 is an absolute whiz at tracking your sleep and why not give it the power to harness that data. Head to Help & Settings in your UP app, enable Health Access. Then open Health and "Allow UP to write data" for Sleep Analysis and Steps. Because of the 7-day battery life, there'll be times when you must part from the UP3 in order to replenish it. However, it's wise to plan charging cycles so the device doesn't conk out on you in the middle of the night and hence skewing the sleep data you've been collecting all month. error message - whoops, looks like something went wrong - comes when I tried to submit my page. Please address my concern.